Yin yoga is one of many types of yoga taught at the Columbia Basin Racquet Club. Yin yoga is more slow-paced, where the postures, or asanas, are held for longer periods of time. In this post, I’ll share about my first ever yin yoga experience at CBRC. I went into class not knowing what to expect at all. 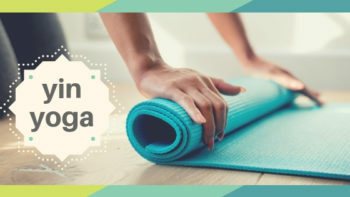 Never having heard of yin yoga before, I did a quick internet search, and was happy to read that this style of yoga is more slow-paced. It’s been a year since I attended a formal yoga class, this would be my first time doing yoga at CBRC, and my first time practicing yin yoga. I brought my husband along with me, and we showed up to class a few minutes early to scope out the room and get set up. I quietly sat cross-legged on my mat, noticing that other students had all sorts of props ready for class. As soon as the instructor came in, my hesitations quickly vanished. She recognized that we were new and instructed everyone on what props to grab for the class: blocks, a bolster, and towels. With the lights turned off, blinds drawn on the windows, and soothing music quietly playing, our practice began. Immediately I closed my eyes and followed along as the instructor guided us through postures, while sharing breathing guidance and words of wisdom about yin yoga. Her directions were very easy to understand, and she took time to explain everything carefully. Poses were held for longer period of times (3-5 minutes) and we welcomed gravity into our poses. We practiced a few asanas that I had not tried before, like the Anahatasana (melting heart pose) and Mandukasana (frog pose). I knew that I was doing the poses wrong, because my body was saying “Ouch, this does NOT feel right!” The instructor silently came over and helped me re-adjust correctly, without an ounce of criticism in her voice. Instantly, my body felt much better. I love the wisdom behind yoga, especially the idea of listening to your body, and not practicing self-harm. The instructor encouraged us to speak words of love, acceptance, and forgiveness to our bodies whenever we were frustrated or disappointed with ourselves. In doing so, my self-doubt and disappointment flowed away. These are great lessons to use off the yoga mat in everyday life. Time was non-existent during class, and before I knew it we were moving into our final Shavasana (corpse) pose. I haven’t felt this relaxed in months. Although I do enjoy the more active yoga classes, my body felt truly stretched and warmed to the core. Yin yoga accesses the fascia, or fibrous tissues in our body that encloses muscles and other organs. This deep, soothing practice would be great after hard workouts and strenuous practices. I left class with a clear mind, and a body free of tension. If you are looking for a new group exercise, or slow-paced practice, come out and practice yin yoga with me at CBRC! You’ll leave feeling restored, refreshed, and grateful for allowing yourself to practice something new.